Hammerhead sharks have an advantage over other sharks when it comes to seeing what’s around them. Their eyes are set further apart, one placed at either end of their unusually shaped heads, called cephalofoils. Nine different types of hammerheads have been identified, each with slightly different heads, size and habits. Studying sharks in the wild is difficult, and information regarding their biology and lifestyle is limited. 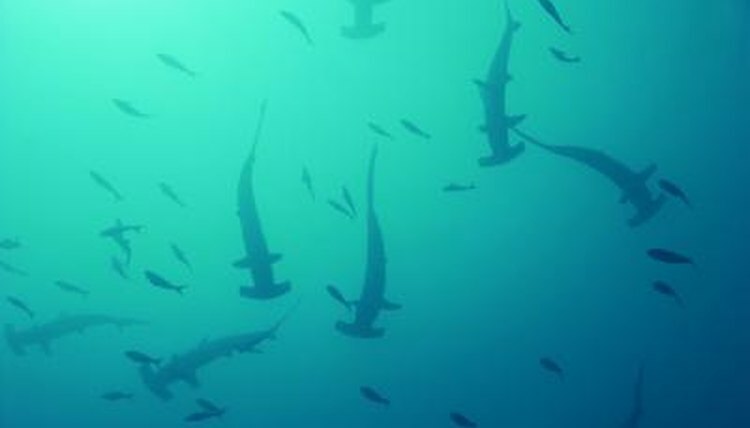 Sharks, including many hammerheads, are believed to mate near the bottom of the ocean. Scalloped hammerhead females gather together in big schools. Males seek them out for breeding, and during the actual mating process the sharks stop swimming and sink until they break apart and begin to swim again. The great hammerhead doesn’t always follow the same mating behavior as the others and has been spotted breeding near the water’s surface. A pair was observed in the Bahamas circling each other and swimming up from the bottom to complete their mating at the top of the water. Hammerhead sharks gestate their young for nine to 11 months, depending on the species. The female will have between four and 42 babies, called pups, which are born alive and able to care for themselves. Baby hammerheads have more rounded cephalofoils than adults, making it easier for birthing. As they emerge from their mother the young quickly swim away to avoid becoming her next meal. Young hammerheads eat a diet similar to the adults of their species, including fish, octopuses, crabs, lobsters and squid. Since larger sharks will eat the small ones, juvenile hammerheads must be quick to hide until they are large enough to be safe from most ocean predators. These sharks reach sexual maturity at different points in their lives, depending on species and on environment and growth rate. Female scalloped hammerheads are sexually mature when they reach about 6 feet in length, usually at around 15 years of age. Males mature much sooner, sexually active once they are about 4.5 feet long, usually by the age of 6. Great hammerheads are the largest of the hammerheads, growing up to 20 feet long and weighing as much as 1,000 pounds. Their life spans average 20 to 30 years. Scalloped hammerheads, named for the series of grooves along the front of their snouts, are about half that size, reaching 8 to 10 feet long and typically weighing between 250 and 350 pounds. Life span estimates for the scalloped hammerhead vary, but the oldest one studied was believed to be at least 31 years old when caught. What Preys on Humpback Whales? What Is a Baby Whale Called? How Do Adult Box Jellyfish Take Care of Their Young? What Are Some Examples of Hermaphrodite Fish?